Whenever a stepmom is portrayed in a movie or television show, there is usually a little drama and tension. While being a stepparent is full of challenges, there are far more rewards of being a stepparent than difficulties. People may not always choose to talk about the rewards, but they are there. Sometimes you just have to open your eyes to the positive that lies hidden under layers of hurt that may be in your new family’s history. What may begin as a challenging start, can turn over time to a beautiful relationship. Let the weight be lifted because you do not need to carry the same stresses as the biological parents. You are not a replacement mom. Spend time getting to know your stepchild and grow a strong relationship. Be a safe place for them to come to and feel welcomed to share. Since you are a neutral party, you can actually be the one who brings both sides together. Many times there is a lot of misunderstanding and hurt after a divorce. Sometimes bringing in someone new can help break the dysfunctional cycles that have been in place in a family. Always speak good of your stepchild’s biological parents. Encourage that while things may be tough, they really do just want the best for their kids. An easy way to do this is to support their parents in the decisions they make, even if you disagree. Show the kids that you support the decision and are not there to create more dysfunction. Training kids is such a rewarding experience. You are influencing a life. Bonds are formed as you are able to pour out into another child. Pour into your stepchildren, just as you would with your own children. Set a standing date with the kids where you spend time together, connecting and sharing. Look for the positive in the kids and how you can spur them on. Being a stepparent can be tons of fun. When you switch your attitude to the right course, you will see how much fun you can have! While kids are a lot of work, they do make everything fun. What are you passionate about? Crafts? Sports? Outdoors? Incorporate your passions into what the kids do and how you can make moments fun and special. This is your chance to start fresh as a family. You have a blank slate to start with. What traditions do you want to start? What characteristics do you want your family to grow? Talk to your spouse and set a plan. It is never too late to build a strong family. What a sweet reward this is! While this may seem like a silly reward, there is some truth here. All the moms can breathe a sigh of relief in knowing you have no pregnancy, no post birth to deal with. You have been given a beautiful package without any wear on your own body. You are loved for being you! This is the best reward of all! There is no obligation to love or even be liked by the kids. When you start to see the love pouring out of them, you will feel the most incredible connection. Love is what makes a family, not blood. The rewards are sweet and plenty. They could go on and on. 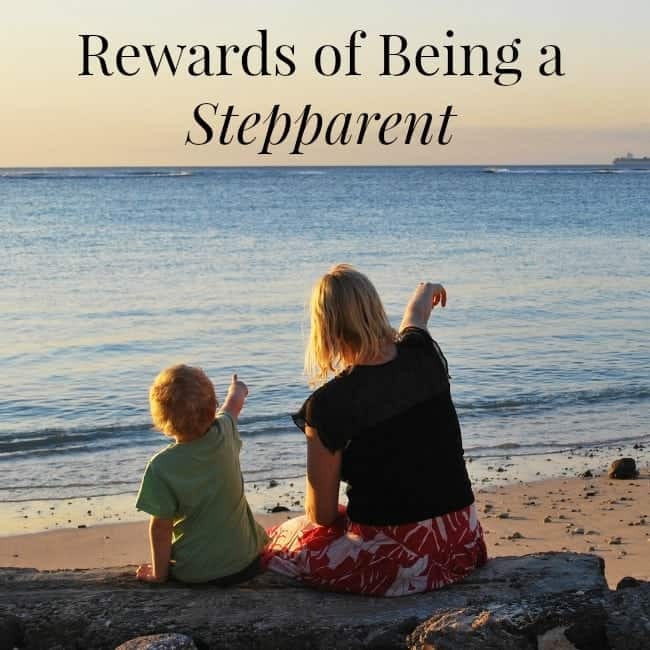 We can be honest about the challenges and focus on the rewards of being a stepparent. 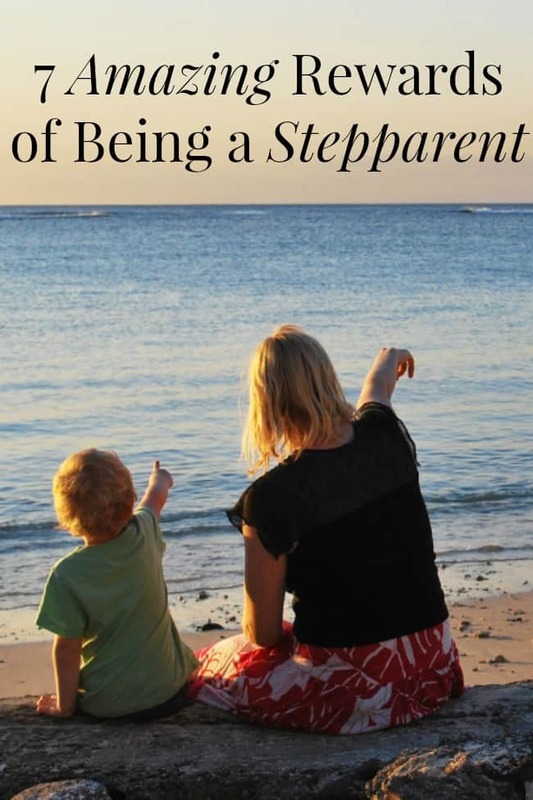 Are you a stepparent? What would you add to this list?